These shortcuts lead to the license section for different types of products available at Imphenzia.com. Although not legally binding, everyday summaries are included in these blue boxes for convenience. This End User License Agreement (“Agreement") between you (“you” or “your”) and Imphenzia AB (“Imphenzia AB”) sets forth the terms and conditions and governs the use of products ("Product(s)") purchased by you from Imphenzia AB and services ("Services(s)") available on imphenzia.com. Which Means: This is a legal agreement between you and us. This Agreement is effective from date and time of payment for Product(s) and is effective in perpetuity. Upon payment to Imphenzia AB for Product(s) you accept this agreement. Which Means: The agreement becomes effective when you pay for a product and the agreement lasts forever. You may embed, use, integrate, and duplicate Music in your video games. You may embed, use, integrate, and duplicate Music in promotional material for your video games. Which means: You can use the music in games that you create and in videos to promote your game. This includes games that you sell. You may not claim ownership of Music. You may not claim the Music as your own work. You may not assign, transfer, rent, or sub-lease Music. You may not sell Music in part or in whole (except as permitted in Agreement). You may not distribute or share Music privately or publicly (except as permitted in Agreement). You may not use Music in part or in whole to create new music. You may not use Music in End User Product(s) other than video games and promotional material, such as videos, film, TV, movies, and podcasts, without first entering into a separate agreement with Imphenzia AB for such purposes. You may not include or embed Music in Game Asset(s) without first entering into a separate agreement with Imphenzia AB for such purpose. This license is not transferrable. All sales are final, refunds are not provided. Which means: Don't sell or give the music to anyone. Only use the music in games that you create and in videos to promote your game. If you want to use music for other purposes, such as in YouTube videos or TV/film, contact me to discuss a separate license. You may store and use Music on all devices that you own and/or use. You may store Music in areas on networks and services that are exclusively accessible to you. Which means: Store and listen to the music on all your devices. You may not use the Music in any End User Product(s). You may not sell Music in part or in whole. You may not distribute or share Music privately or publicly. Which means: Don't sell or give the music to anyone. Don't use the music for any other purposes than listening to (see Music for Games Non-Exclusive License for other use). You may embed, use, integrate, re-record, and duplicate Sound Effect(s) in your and your clients’ End User Product(s) such as video games, film, television, video, commercials, music, multimedia, and podcasts. You may modify the Sound Effect(s) to suit your or your clients’ End User Product(s). You may synchronize Sound Effect(s) with visual images. You may use Sound Effect(s) as part of public viewing or broadcast of your and your clients’ End User Product(s) and productions. Which means: You can use (and modify) the sound effects in things like video games and film that you make for yourself or for your clients. You may not claim ownership of Sound Effect(s). You may not claim the Sound Effect(s) as your own work. You may not assign, transfer, rent, or sub-lease Sound Effect(s). You may not sell Sound Effect(s) in part or in whole (except as permitted in Agreement). You may not distribute or share Sound Effect(s) privately or publicly (except as permitted in Agreement). You may not use Sound Effect(s) in part or in whole to create new sounds for sale or for free distribution. You may not use Sound Effect(s) in software or services that generates content, such as videos, music and sounds, without first entering into a separate agreement with Imphenzia AB for such purposes. You may not include Sound Effect(s) in Game Asset(s) without first entering into a separate agreement with Imphenzia AB for such purpose. Which means: Don't sell or give the sound effects to anyone. Don't use the sound effects to create new ones that you sell or give away. 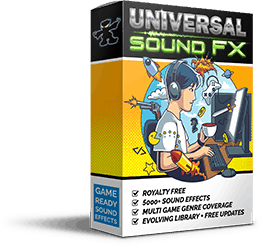 If you want to include any sound effects in game assets, software or services that you create, contact me to discuss a separate license. You may embed, use, integrate, and duplicate Image(s) in your and your clients’ End User Product(s) such as web sites, video games, film, television, video, commercials, multimedia, and print. You may modify the Image(s) to suit your or your clients’ End User Product(s). You may use Image(s) as part of public viewing or broadcast of your and your clients’ End User Product(s) and productions. Which means: You can use the images in things like games, videos, magazines, and books that you make for yourself or for your clients. You may not claim ownership of Image(s). You may not claim the Image(s) as your own work. You may not assign, transfer, rent, or sub-lease Image(s). You may not sell Image(s) in part or in whole (except as permitted in Agreement). You may not distribute or share Image(s) privately or publicly (except as permitted in Agreement). You may not use Images in part or in whole to create new images that you sell or publicly distribute. You may not use Images in End User Product(s) that generates content, such as images and/or videos, without first entering into a separate agreement with Imphenzia AB for such purposes. You may not include Image(s) in Game Asset(s) without first entering into a separate agreement with Imphenzia AB for such purpose. Which means: Don't sell or give the images to anyone. Don't use the images to create new ones that you sell or give away. If you want to include any images in game assets or services that you create, contact me to discuss a separate agreement. A "Student License" may be used for non-commercial purposes. An "Indie License" may be used by individuals and commercial Legal Entities that had a Revenue of less than USD $100,000 the prior fiscal year. Education institutions and academic institutions may purchase and use "Student License" based on the number of maximum concurrent users of Space Fabricator. You may store, install, and use Space Fabricator on all devices that you use. You may embed, use, integrate, and duplicate images generated with Space Fabricator in your and your clients’ End User Product(s) such as web sites, video games, film, television, video, commercials, multimedia, and print. You may modify images generated by Space Fabricator to suit your or your clients’ End User Product(s). You may use images generated by Space Fabricator as part of public viewing or broadcast of your and your clients’ End User Product(s) and productions. Which means: You must have one license per user. You can install Space Fabricator on as many devices as you want if you only use it on one device at a time. You can use the images you generate with Space Fabricator in your and your clients' products such as video games, videos, magazines, and books. A student license is OK to use if you don't attempt to make money from what you create. You may not use the "Student License" of Space Fabricator for commercial purposes. You may not use the "Indie License" of Space Fabricator if you as an individual or commercial Legal Entity had a Revenue of USD $100,000 or more the prior fiscal year. You may not assign, transfer, rent, or sub-lease Space Fabricator. You may not sell content generated with Space Fabricator that compete with Product(s). You may not sell Space Fabricator. You may not distribute Space Fabricator privately or publicly. You shall not reverse engineer Space Fabricator in part or in whole. You shall not circumvent any functionality in Space Fabricator. Which means: Don't sell or give the software to anyone. Don't hack or crack the software. Don't use the software to sell the images. Use the correct license depending on if you are student, small or big company. Don't give or sell your license to anyone. You may install, duplicate, store, and use Game(s) on all devices that you own or use. You may store Game(s) in areas on networks and services that are exclusively accessible to you. Which means: You can install and play games on all devices that you use. You may not assign, transfer, rent, or sub-lease Game(s). You may not sell Game(s) in part or in whole. You may not distribute or share Game(s) privately or publicly. You shall not reverse engineer Game(s) in part or in whole. You shall not circumvent any functionality in Game(s). Which means: Don't sell or give the games to anyone. Don't hack or crack the game. You may use content within Game Asset(s) when creating games and applications in Unity for both non-commercial and commercial purposes. You may record videos containing content within Game Asset(s) and distribute videos as you see fit and for promotional purposes. Which means: You can use Game Asset(s) to make games including games that you sell. You may not assign, transfer, rent, or sub-lease Game Asset(s). You may not sell content generated with Game Asset(s) that compete with Product(s). You may not sell content within with Game Asset(s) that compete with Product(s). You may not sell Game Asset(s) in part or in whole. You may not distribute or share Game Asset(s) privately or publicly. You shall not reverse engineer Game Asset(s) in part or in whole. Which means: Don't sell or give the game assets (or parts of them) to anyone. Don't create competing products using the assets that you sell or give away. Don't sell or give your license to anyone. You agree and acknowledge that your use of Product(s) is entirely at your own risk. You agree that Imphenzia AB will not be liable, under any circumstances, for any (a) termination, suspension, loss, or modification of Product(s) and/or Service(s), (b) use or inability to use the Product(s) and/or Service(s), (c) access interruptions or access delays to Product(s) and/or Service(s), (d) loss incurred in connection with use of Product(s) and/or Service(s), or (e) unauthorized access to or alteration of your transmissions or data. Imphenzia AB will also not be liable for any indirect, special, incidental, or consequential, damages of any kind regardless of the form of action. In no event shall Imphenzia AB’s maximum aggregate liability exceed the total amount paid by you for the Product(s). Any material downloaded or otherwise obtained from Imphenzia AB is done at your own discretion and risk and you will be solely responsible for any damage to you, third parties, computer systems, audio equipment, or loss of data that results from the download or use of such material. You agree to defend, indemnify, and hold harmless Imphenzia AB, directors, and employees for any loss, liabilities, damages, costs or expenses arising out of or related to your use of or connection to the Product(s) and/or Service(s). The Product(s) and Service(s) are provided to you on an “as is,” as available basis. Imphenzia AB makes no representations, warranties or guarantees of any kind whatsoever, express or implied, in connection with this Agreement. Imphenzia AB further disclaims any representation or warranty: (i) that the Product(s) and/or Service(s) will meet your specific requirements, (ii) that the Product(s) and/or Service(s) will be uninterrupted, timely, secure, or error-free, or (iii) that any errors in the Product(s) and/or Service(s) will be corrected. Which Means: Product is “as is” so it may have errors or interruptions and we provide no warranties. This Agreement will be governed in all respects by the substantive laws of Sweden. Any disputes arising from or related to this Agreement or its enforceability, or the business relationship between the parties, shall be finally settled by binding, confidential arbitration held in Stockholm, Sweden, using the rules and procedures of the Swedish Arbitration Association. The arbitration proceedings shall be conducted in English and all documentation shall be presented and filed in English. Which Means: A court case must take place in Stockholm / Sweden and English language must be spoken. An individual or commercial Legal Entity who has contracted or hired you for work. Software and/or software components designed to facilitate the development of video games and content (for example, without limitation, computer graphics, including 3D computer graphics, sounds and music), tutorials and other digital materials created to become integrated parts of video games and interactive media. Software, video, and audio such as video games, film, television, video, commercials, music, multimedia, and podcasts created by you or your client. Product(s) in the form of images created, generated, designed and/or sold by Imphenzia AB. A license that may be used for use of software by individuals and commercially Legal Entities with a Revenue less than USD $100,000 prior fiscal year and by non-profit organizations. Any company, corporation, limited liability company, general partnership, limited partnership, limited liability partnership, proprietorship, joint venture or other form of business organization, and includes, without limitation, any government, non-for-profit, educational or academic institution, including but not limited to any primary or secondary school, vocational school, college or university. Product(s) in the form of music created and/or sold by Imphenzia AB. Goods created and/or sold by Imphenzia AB such as, but not limited to, sound effects, music, images, game assets, software, and games. Annual gross revenue, both operating and non-operating, or raised and/or granted funds, as accounted by the Legal Entity during the prior fiscal year. Revenue are defined in USD. Product(s) in the form of recordings, sound effects, sounds, and audio files recorded, created, generated, designed, and/or sold by Imphenzia AB. Computer software named Space Fabricator created by and sold by Imphenzia AB. A license that may be used for non-commercial use of software created by and sold by Imphenzia AB. Product(s) in the form of video games which are electronic games that involves interaction with a user interface to generate visual feedback on a video device such as a computer monitor or TV created, designed, and/or sold by Imphenzia AB. Which Means: When capitalized words appear in the agreement, this is what the words mean. The Product(s) are property of Imphenzia AB and copyrighted by Imphenzia AB. Copyright: Imphenzia AB 2017. All Rights Reserved. Which Means: Only we can control how products are used and distributed.